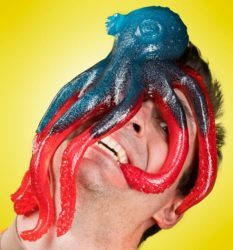 This crazy giant gummy octopus could be a great treat for pranksters or kids who want to have fun. But as like the real one, it’s not vegetarian. Its eight tentacles are camouflaged with dual flavored and are made entirely out of gummy. It will weight around 3 pounds with over 10 inches in length.